The care of older people in Scotland is a national disgrace. Our care services are hanging by a thread and, as austerity has bitten, it is the elderly and vulnerable in our community who are paying the price. 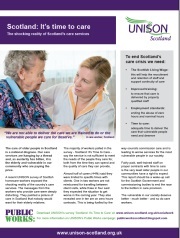 A recent UNISON survey of Scottish homecare workers exposed the shocking reality of the country’s care services. The messages from the workers who provide care were deeply disturbing. They painted a picture of care in Scotland that nobody would want for their elderly relatives. The majority of workers polled in the survey - Scotland: It’s Time to Care - say the service is not sufficient to meet the needs of the people they care for, both from the time they can spend and the quality of care they can provide. Almost half of carers (44%) said they were limited to specific times with clients. One in two workers are not reimbursed for travelling between client visits, while three in four said they expected the situation to get worse in the coming year. They also revealed one in ten are on zero hours contracts. This is being fuelled by the way councils commission care and is leading to worse services for the most vulnerable people in our society. Fairly paid, well-trained staff on proper contracts with time to care is the very least older people in our communities have a right to expect. This report should be a wake-up call for the Scottish Government and commissioning bodies to end the race to the bottom in care provision. The vulnerable in our society deserve better - much better - and so do care workers. 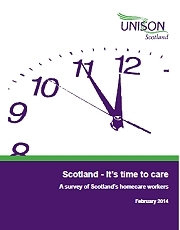 See also It’s time to care, says UNISON as survey reveals Scotland’s care crisis press release.